Tis the season for ribbons! 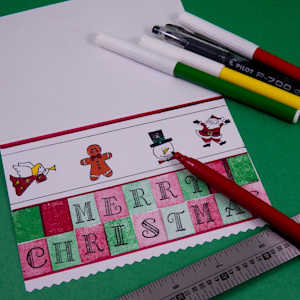 Take your homemade Christmas cards up a notch by adding a ribbon edge. In this tutorial, you'll learn how to create a decorative cut edge that is enhanced with a ribbon backing. 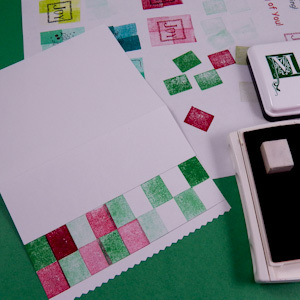 You'll also learn how to make a stamp from an eraser and use it to create plain and checkered backgrounds. Tip: The gift tag printables makes it easy to create gift tags in the same way. Related craft: Make ribbon edge cards for any occasion, see card ideas in All Occasion Ribbon Edge Cards. This greeting card tutorial builds on the previous tutorials in the original Greeting Card Class set of tutorials. If you are new to card-making, review these tutorials for ideas and basic techniques. 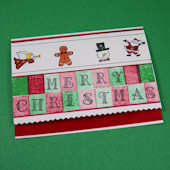 The sample card uses the traditional Christmas colors of red and green with accents in black, yellow and brown. 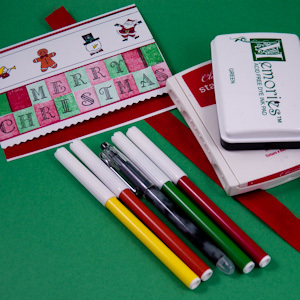 Select markers, stamp pads, and a ribbon to render the color theme. Tip: Use whatever color scheme you like. 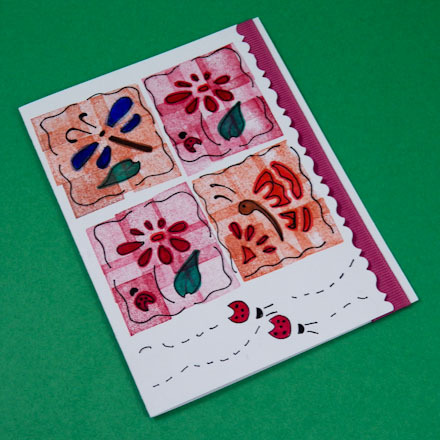 Base the color selections on your card's theme, the ribbon color or the rubber stamp images. Keep the number of colors to just a handful. Unfold the card blank. Draw a light pencil line ½" in from the bottom edge. Cut along the traced line with the decorative edge scissors. Carefully align the scissors' pattern as you cut. Erase any remaining pencil marks. Make a rectangular stamp for stamping backgrounds from a white plastic eraser. 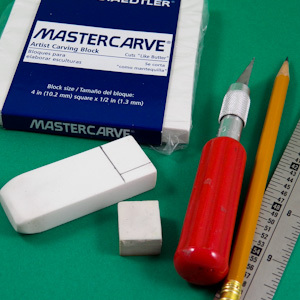 At the end of the eraser, use your pencil to draw a rectangle that is approximately 5/8" by ¾". Cut out the rectangular stamp using your craft knife. Tip: Craft stores and school supply outlets sell carving blocks for making stamps. 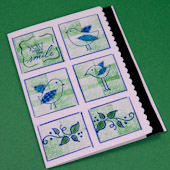 The blocks are easier to cut than erasers, and with basic carving tools, you can make rubber stamps of your own design. 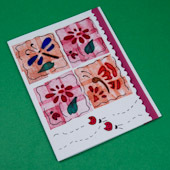 Before stamping the card, make samples of the design on scrap paper. 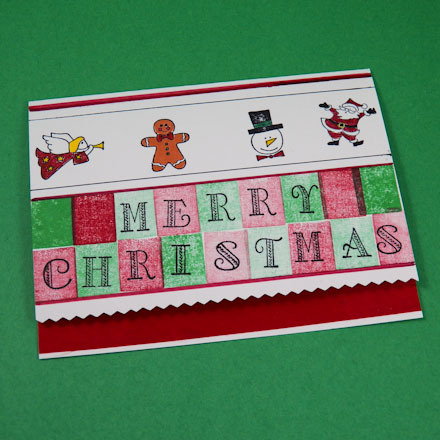 With the rectangle background stamp, create a red and green checkerboard that is 2 by 9 blocks. Stamp "Merry Christmas" in black ink on the blocks. See if the checkerboard fits on the card, and make sure the letters are readable. Make adjustments as needed—overlap or spread out the blocks and adjust the lightness of the checkerboard blocks. Tip: For lighter background blocks, make the stamp's first impression on scrap paper, then stamp three more impressions on the card before re-inking the stamp. Draw light pencil lines as a guide for stamping the checkerboard. Draw one line ¼" from the cut decorative edge and the second line about 1½" (2 times the background stamp height) from the first line. Stamp a checkerboard pattern of alternating red and green blocks. After the ink is dry, erase any visible pencil lines. Tip: Instead of stamping the background, you can use a strip cut from the Plain Checkerboard Border ePaper. See the sidebar for more details. 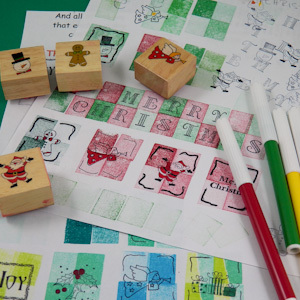 Stamp "Merry Christmas" on the checkerboard design in black ink. Above the checkerboard, stamp your Christmas images. Tip: Stamp Christmas images that are right- or left-facing with the face aligned toward the card's center. 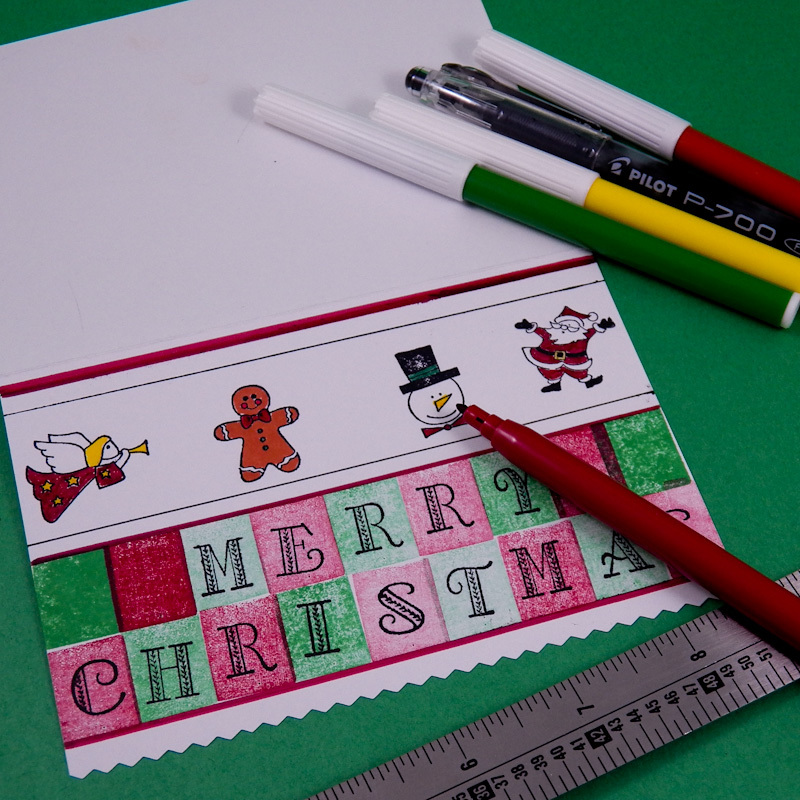 Tip: If you don't have alphabet stamps, cut out one of the printable checkerboards in the Merry Christmas Checkerboard Border ePaper. See the sidebar for more details. 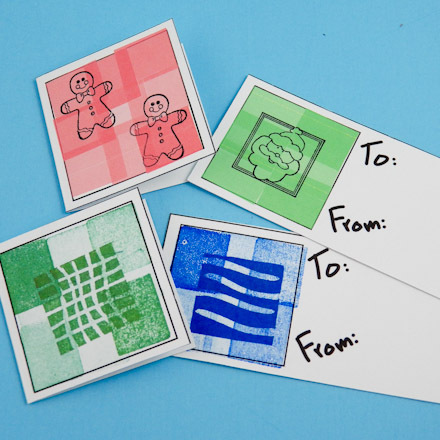 Use the markers to color the stamped images and draw accent lines. The sample card has thick red lines on the top and bottom of the checkerboard and near the top of the card. Narrow black lines accent the areas above and below the stamped images. 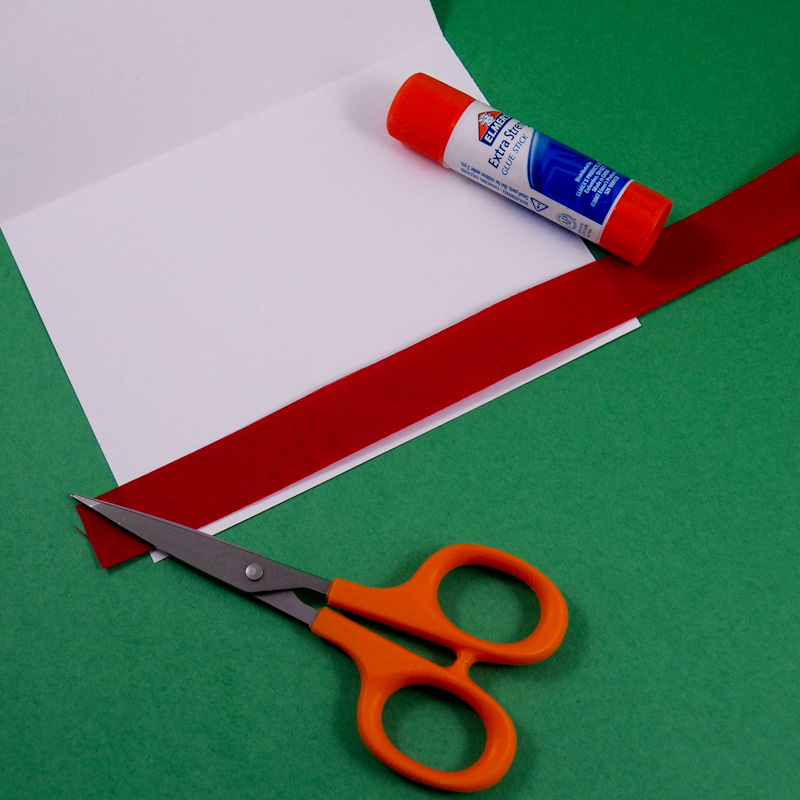 Cut a 6" length of ½"- to ¾"-wide red ribbon. Open the card flat to reveal the inside. Glue the ribbon near the bottom of the card's inside, leaving a small white margin at the bottom. 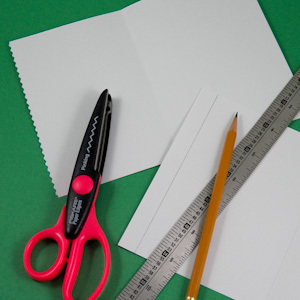 Use scissors to trim excess ribbon from the sides. More? You can easily make several identical cards by setting up a production line for yourself, or for you and a helper or two. To do this, take 6 or so cards through each step together. That's it! Your card is complete! 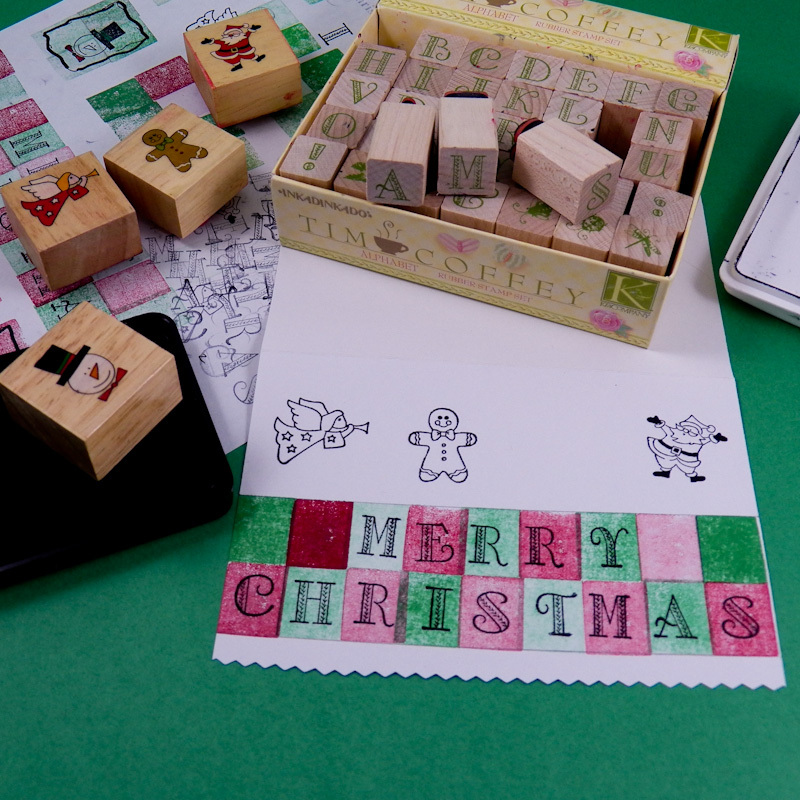 Tip: If you don't have an alphabet rubber stamp set, print, cut and glue borders from the Merry Christmas Checkerboard Border ePaper. Or, if you don't have the red and green stamp pads for making the checkerboard border, download and print the Plain Checkerboard Border ePaper. Tip: A ribbon edge will enhance a simple card design. 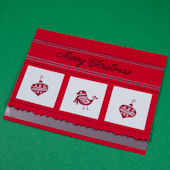 This red Christmas card with a silver ribbon edge has red images stamped on 1¼" white squares, a greeting stamped in black, and accent lines of black and silver. Tip: Make gift tags using the background stamp, and other handmade or commercial stamps. Print Aunt Annie's stamped squares gift tags printable or the blank gift tags printable and stamp as you desire. Cut out the tags and fold the large ones in half. Optionally, punch a hole in the corner to tie to the package. Tag Ideas: On the blank gift tags printable stamp the squares lightly with your background stamp made in this project, and then stamp a darker image with another handmade stamp or a commercial stamp. On the stamped squares gift tags printable, the squares are already stamped. Tip: Make ribbon edge cards for other occasions. Use a simple seasonal color scheme that coordinates with the ribbon's color. See card details in All Occasion Ribbon Edge Cards. Tip: Traced stencils are an alternative to stamped images. Use a fine-point black pen to trace the design, then fill traced areas using colored markers. See card details in All Occasion Ribbon Edge Cards.